Published: April 27, 2015 at 03:14 p.m. Updated: April 27, 2015 at 03:37 p.m. The Washington Redskins loom as a potential wild card in the top five on Thursday night. 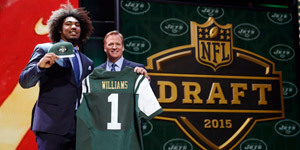 Redskins general manager Scot McCloughan told reporters during his pre-draft press conference on Monday that he anticipates phone calls if USC defensive lineman Leonard Williams falls to the Redskins with the fifth overall pick. Williams is believed by some to be the best player in the entire draft class. The Redskins don't have a major need in the trenches after signing Terrance Knighton and Stephen Paea in free agency. Would the Redskins invest in Williams with other more pressing needs on the roster? "I would not hesitate because, like I said, we have to add good football players -- especially up front on both sides of the ball," he said. "But, it might bring a trade more into play if all of the sudden ... we do have to pick up our defensive front but also with Terrance, he's on a one-year contract, we've got to protect ourselves, and any time when you can get a good defensive lineman in the draft, you need to take him. They're very hard to come by." McCloughan indicated that a pass rusher could be atop Washington's wish list. "As they say, defensive end/outside linebacker in our 3-4 scheme, you look for a pass rusher," he said. "They're hard to find. We're very lucky to have Ryan (Kerrigan) on the team. He's one of those players and hopefully not just in the first round but throughout this draft we can add a couple more pass rushers." McCloughan almost seemed to catch himself when talking about the possibility of Williams remaining on the board at 5. It must be an exciting thought for a first-year GM -- take the guy seen as an instant impact player or pull off a trade that gives his team the opportunity to acquire even more talent. Or, of course, Williams is off the board and all this speculation is for naught. Such is life on the week of the draft.